A couple of articles I’ve come across recently have gotten me thinking about dinosaur names, in particular a pair of (admittedly fluffy) articles on about.com, the “10 Worst Dinosaur Names” and the “10 Best Dinosaur Names“. The winter term draws to a close, the fossils come out of hiding one last time. River of Death gets a name change. I haven’t talked a whole lot here about the Pipestone Creek Dinosaur Initiative or the proposed River of Death and Discovery Museum. The area around Grande Prairie, Alberta, about a five hour drive northwest of Edmonton, is rich in Late Cretaceous fossils. The most famous locality is Pipestone Creek, where hundreds of the horned dinosaur Pachyrhinosaurus perished millions of years ago. For nearly ten years, a dedicated group of folks in Grande Prairie have been trying to get their own palaeontology museum off the ground. The working name for the museum was the River of Death and Discovery Dinosaur Museum. However, the word ‘death’ in the museum name has made it difficult for the museum to get as many sponsors as they would have liked. And so it was announced yesterday that the museum would be renamed to the Philip J. Currie Dinosaur Museum! You can read more about the name change at the Grande Prairie Daily Herald-Tribune’s article. There are some exciting things coming up this summer for the museum foundation, including the Akroyd Family and Friends Dinosaur Ball (yes, those Akroyds! ), and the University of Alberta will return to our annual excavations at the Wapiti River Pachyrhinosaurus bonebed and the newly-reopened Pipestone Creek bonebed. 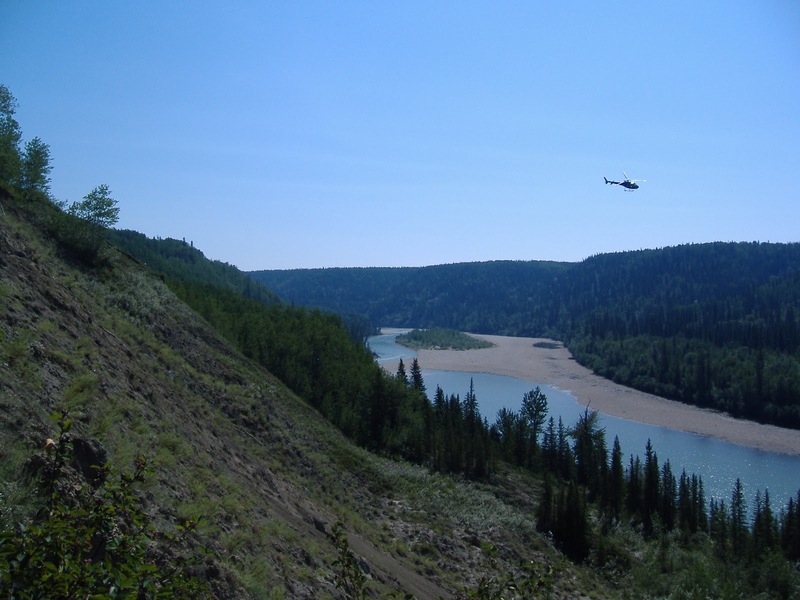 A helicopter approaches at the Wapiti River bonebed during the 2009 excavation. Helicopter lifts are the only way the large blocks can be brought up to the edge of the river valley.